In May, I wrote about Mike Mann’s sale of WashingtonJournal.com for $75,000. It was notable because Mike had reportedly acquired the domain name for just $350, and the ROI was outstanding. According to UDRPSearch.com, a UDRP was just filed against WashingtonJournal.com. The UDRP was filed at the National Arbitration Forum (NAF), and it is case #1741966. Because the UDRP was filed at NAF, the complainant in the UDRP is not known and will not be reported until the decision is rendered. I did a Google search for “Washington Journal” to see if I could find out who might have filed the UDRP. 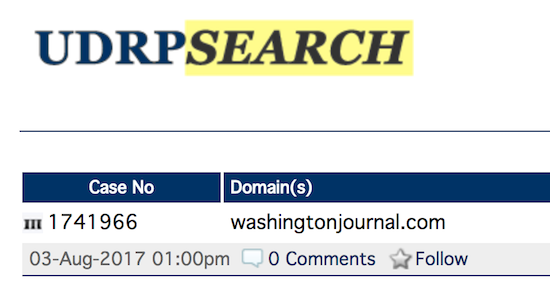 It looks like C-Span has a program called “Washington Journal,” so perhaps they filed the UDRP for this domain name. This is a complete guess though since the first few Google results I saw are in reference to that. The “Washington Journal” branding seems fairly generic to me. I will track the UDRP on UDRPSearch.com and provide an update when a decision is rendered. Update: The complainant won the UDRP, as discussed by Andrew Allemann of DNW. The actual decision can be found here. As someone speculated in the comment section, the complainant in this UDRP was CSPAN. Looks like a lefty rag. surrounding the rightful owner of the domain name??? I agree with you. I don’t understand why some people seem to make everything about politics. Mike Mann escape a big one. Profit then let the buyer lose the domain under UDRP. Check. Checkers. Mate! Noooo, Mike didn’t escape anything. It is not uncommon for a company or the like to watch a name they want transfer ownership and use that move and its then use as a signal to move forward with a dispute thus avoiding having to buy it. The good faith ownership Mike had is non transferable. My bet is whomever it was wanted this name already and waited to pounce OR saw it’s sale reported and the light bulb went off. There is always the chance it is a RDNH as well or simply too generic but time will tell. Well, C-Span (as the National Satellite Cable Company) has a trademark on the term “Washington Journal”, since 1997. It’s in the TM class for news and entertainment, although it does reference “television”. So this term isn’t maybe as generic as it looks at first glance. It’ll certainly be fascinating to see how this works out. Why would anyone spend $75,000 on a domain name without searching the trademark database (for free)? It takes a few minutes to discover that there is a trademark since 1997. Any attempt to separate buying and selling of domains from Trademark law and UDRP policy is completely futile and costly. The filer probably didn’t want to go up against Mike Mann, an entrepreneur with deep pockets. These entities are smarter than we believe. Sneaky scoundrels!! How long to UDRP transfers take to enforce? Looks like its still the website it was previously.